Meet the band … so far! Confession time, except in rare circumstances *cough*fellowCanucks*cough* I don’t pay a lot of attention to the changing roster of musicians who back up David Archuleta. So long as he’s happy with them, and they make David and his songs sound as great as they deserve, I’m good. That said, I’ve definitely been curious about the reported jazz “prodigies” who’ve been hand-picked by David to rehearse/jam with him weekly and accompany him on the road. The director called “cut” for the day, and Mark Nilan Jr. headed back to his trailer. “It’s the band!” Nilan heard the girls shout as he crossed the parking lot. It was one of the first moments when Nilan, 26, realized what was happening to him. The second moment came after opening a flooded inbox of “saw you on TV!” e-mails from friends and family. Mark Nilan Jr. on the set of Glee. The hit Fox television show “Glee” cast Nilan as the keyboardist of the William McKinley High School jazz band. Nilan played behind the high school’s show choir stars in several episodes during the last six weeks. “I totally didn’t see it coming, but I’m loving every minute of it,” Nilan said while sitting at a keyboard station in his Saugus home. From time to time, Nilan’s father still reminds his son of one particular car ride home. His parents had just picked up the 15-year-old from a summer course in jazz. Music in general was not new. His father, Mark Nilan Sr., was a television and radio music professional. Ray Charles’ voice was heard often around the dinner table while Nilan was growing up in Detroit. “Jazz is all about improvisation and creating from yourself,” he said. “My life goal had fully hardened,” he said. It was Michaels who encouraged Nilan to play keyboard for a gospel church in Detroit. Michaels thought the experience would grow the college musician’s talent and confidence, Nilan said. “It immediately makes you not shy,” he said. “If you study music too hard, like by the book, you don’t play with feeling,” he said. Nilan also stepped in as the church’s music director for three years. Now he is directing music at St. Clare of Assisi Catholic Church in Canyon Country. Under the direction of David Roitstein, CalArts’ jazz program director, Nilan began writing his album during his senior year. After making some phone calls and working connections through his father, Nilan formed a band he considered to be “a dream come true” including: bassist Abraham Laboriel; drummer Gregg Bissonette; guitarist Ricky ‘Z’ Zahariades; and percussionist Brad Dutz. “These guys are the best,” Nilan said. Nilan’s father owns a recording studio, so he always had the opportunity to record an album. Nilan wants to break the stereotype that contemporary – or smooth jazz – is elevator music, he said. The instrumental songs are an expression of diverse influences in Nilan’s life, from his hometown and discovery of his love for jazz to his transformation within the gospel church. “Being a musician, you don’t think about being on a TV show,” he said. All the training, schooling and dedication are paying off. But Nilan doesn’t doubt some amount of good fortune has been on his side. It’s good to be in the right place at the right time, but you have to be ready, he said. “Have it together, and just be ready for when those calls come,” he said. “Glee” airs at 9 p.m. Tuesdays on Fox. Nilan’s website is http://www.marknilanjr.com. 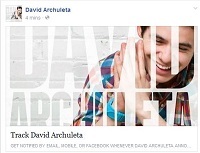 This entry was posted in david archuleta, Special event and tagged David Archuleta jazzmatazz. Bookmark the permalink. 76 Responses to Meet the band … so far! I am so gonna ask her what she knows about him. I am mostly excited that David, the prodigy, is working with all of these genius musicians….and being jazz musicians, it will free David to express himself musically. I am not saying that David is going all out jazz. I am just saying that the influence of jazz is freer……. this is going to be awesome! And! tour dates…. yipppeeee! Really like the sound of Mark Nilan. Sounds like a real musician, where this is his passion (or at least, that’s how that article made him sound lol). Cool that he’s got a backup role on Glee! Haha, I want to go rewatch and episode to try to spot him, lol. Thank You for this well-researched post! I find this even more exciting than word of a record deal. To me, the fusion of genres from this new band represents a new musical freedom that David seeks to now pursue. Since the TOSOD debacle, record labels now mean restrictions and David has endured enough. Instead of waiting on radio station adds and radio plays -TALK ABOUT STRESS – I’m now looking forward to even more fantastic creative musical muses from David and co.
Me, too, Joymus! *waves* “Creative musical muses”… love that! Oh wow, this is awesome–great detective work. This Mark sounds like someone David can really relate to in his approach to music, soul, improv, the works. My hands are sweaty waiting for tour news! 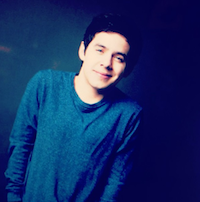 Yes it is true I will be playing bass for David Archuleta. Brian Green is on guitar! We are so pumped for what is coming up for David and that he is surrounding himself with great musicians!!! 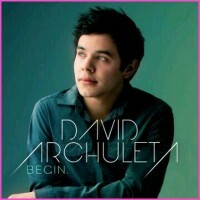 We are very passionate about David’s musicality and talent and eager for a tour!! His Canadian fans look forward to meeting you!!! Thanks so much for commenting and confirming!!! 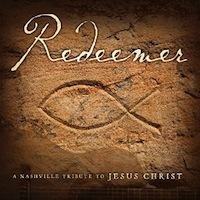 Awesome about Brian Green too!!! Ben are you on twitter??? Wow, cool! Thanks for letting us know, Ben! Hey Ben! So impressed with the musicianship and artistry of the band members. The best of the best with the best. LOL! I bet you are having a blast jamming together! Welcome to the Archie family! This is going to be one sweet ride! Looking forward to hearing you all! and heck yeah….David! LOL! TOfan…when one has been in the desert for so long you should offer them just a few sips of water first off!! How many gallons is this?? Wow and thank you and welcome Ben!! Welcome to all of the band if you should drop by! Thank you TOfan, this is the best news of the new year! I am loving the band!!!!! TOfan!!! Great research, you are the best!!! Fun stuffs, thanks for the newsy post. I’m more interested in this band too for some reason. Guess they’re doing a good job of peaking our interest. HA! Sounds like David is surrounding himself with some superb musicians! Really impressive and I have to say congrats to the new band members. Thank you Ben for your post, you all seem like stellar artists and musicians. Really looking forward to what’s up ahead and to hearing the music! TOfan, great write up, lots to ponder and look forward to! TOfan. YaaaaaaHooooooo! Great research, great info. End of one era for David and start of the next. Exciting times. We first were captured by his talent, then his personage. We have walked together the past 3 years following performances, interviews, tours, tweets, etc. Next a new David, no Jive, no Azoff/WEG, just him without barriers, just his music, talent and voice front and center. Watch out naysayers and doomsdayers! Here comes David Archuleta, live, improv, real time. WOO to the MEGA MAJOR HOOOOOOOO! Kizzi…I believe that you have said it all in a nutshell!… We have gone through the growing pains from site to site. I believe the quiet times are nearly over. Gosh, every time Delaware is mentioned I can’t help but think of this beautiful song by our talented Canadian, Dallas Green — and then I have to watch it over and over, so addicting. fabulous news TOfan – interesting how gospel music seems to come up when jazz musicians talk about their background. And, possible Christmas concert Vermeer – YES! Update: Here’s the vid version, thanks to JR4DA! With all these new jazzy band members, it’ll be interesting to see if David adds instrumental solos to his live act for the first time. As a jazz fan, I just take for granted that the bass or sax player, drummer etc. will get highlighted for a solo somewhere in a live perf. But one thing I’ve noticed about David’s live sets… maybe because those instrumental sections have all but disappeared from pop music… if there’s a stretch with no vocals, he usually starts singing anyway, lol, improvising or humming. Not that I’m complaining mind you! He can whoa whoa whoa like nobody’s business! 😆 It’ll depend on what vibe they’re going for, I guess. A little late to the party, but cannot contain myself! And if we’re excited, imagine what he must be feeling. …think he’s gonna drop a few jaws?! Only true artists can draw this caliber of musicians. Imagination running amok. Can’t go wrong with an awesome bass player like my son!! Jon – I have seen some videos of your son and agree! He is so very talented. he is awesome!!! And he’s so very fortunate to have such a supportive family! So excited to hear their first live gigs! TOfan, thanks for the “off topic” link to Pia’s exit interview. Don’t watch the show anymore really but I am a fan of hers. Sweet that she mentioned David’s cover of DLTSGDOM. We know David’s cover of that song was beautifully the best! Correction……our son – includes mum Lin too and his gorgeous sister Sarah………we were his first number one fans!! 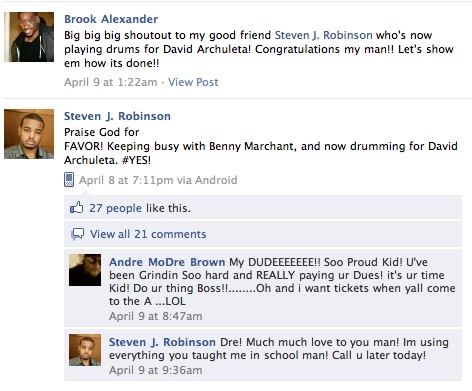 And Steve Robinson……….Dennis Chambers…..say ‘Yo man’!! Nice to see you Mr Shepherd, and mum Lin and gorgeous sister Sarah! We are so excited to see David and his new band. From what we have seen and heard they are a group of amazing young musicians. This is gonna be fun! I am super excited to see what he’ll wear! lol. abanana, “maybe he’ll have super baggy basket ball shorts and super long socks…?” …lol!! The suspense is killing me, haha! Thanks for the research and this great post. These new band members are impressive! The videos give a taste of the treat that lies ahead. Nothing better in concert than watching skilled musicians who are passionate about their work and who have fun while doing it. Need to plan a May road-trip. Aaaah, you are going to be one of the very first to get a glimpse of David with his new bandmates in action? Make sure you take extra batteries!! 🙂 And smelling salts! eeeeep, and you’ll get to hear this! Deb, I saw that tweet of hers retweeted many times on my phone when I was at work tonight, and I NEVER tired of it. It’s so beautiful, so true. I found this and thought it interesting. p.s. I have a 20 month memory of David singing “I’ll Be” outdoors, in the sun, and it still sends tears to my smile. Still. Thanks Betsy. Wow, she is really accomplished and her resume is amazing. (And I thought she might be another aunt!) She was in the audience at AI several times. This just in from Delaware! Shorts-cam, lol! I hope he makes a basket. Any archufans there will go nuts! Go Lupe, is right! Clip of her dancing! and clip of David bounding on the court! “I’m very hands-on down to the smallest detail. I wanted it to be perfect,” he said. “I definitely took my time and made it right. ~~I get the feeling and am thrilled that David will be collaborating with kindred spirits and other prodigious musicians this time. And it does not surprise me one bit that he was self-aware and clear on “who he is” to make such choices. Kizzi…I love your entire post…and I couldn’t agree more or be more excited at the new day I feel dawning in Archuland. love this: just him without barriers, just his music, talent and voice front and center. Watch out naysayers and doomsdayers! Thanks TOfan for all the news…exciiiiiting stufffffff. Oh man, here we go…I need an entirely clear schedule for the rest of 2011! David’s remains THE BEST, for all time, forever n’ ever, amen!! …that said, she did do a nice job. Looks like David is having a great time on the court! Yay, he donned the uniform too. Good for David and good for Lupe…imagine she is pretty good! Had to smile at all the tweets about David, he may not be the best player but apparently pretty speedy on his feet with his little white legs and all, haha. Good for David! What a fun time for everyone and what fun it would be to witness it all. oops.. just to clarify above …might come off like I’m slamming the other musicians he performed with before (Not!) who were great too (Kendra, Mike and all them peeps we loved)…just saying, “this time” as in…what’s happening now…and they seem on the same page and it all sounds verrrry promising! that’s all. ok, now that I cleared that up! LOL.. I’ve been on this dang computer “all over town” tonight…gonna give it a rest! RT @AleshaRenee: @DavidArchie sang Ribbon in the Sky by Stevie Wonder the whole restuarant gave him a standing “O”! NO shorts, eh? You of sooo little faith. Or at least temporarily incapacitated. I’m waiting patiently for the vid of impromptu perf too, like JR and countless thousands. Ribbon In The Sky – Stevie Wonder Oh My HECK! Good thing I am already DAID! Hi awestruck!!!! I agree – it is good that we are already DAID – cause this will definitely finish us off if we weren’t :). Help!!!! I don’t know how to post videos – there are two videos on FOD of David singing Ribbon in the Sky!!!! New vids posted in new thread! Fasten your seatbelts!